I’m back from a relaxing and enjoyable long weekend in the mountains with friends. The Labor Day holiday weekend was spent gazing at mountain views, enjoying Mountaineer football tailgating, hiking up hills, napping, cooking, drinking and taking excursions. Highlights included my first Appalachian State football experience, testing new recipes and checking out both the Inn at Crestwood and the Gamekeeper. I’d highly recommend the Gamekeeper for appetizers and cocktails – I recommend the margarita and mixed game plate (hello emu, pheasant, wild boar and other exotic grilled meats). Back home we made the most delicious late night salad with a less exotic meat – a filet mignon. We used David Burtka’s recipe from the TV special Ina in LA (I’ve raved before). His Rib-Eye Steaks with Porchini Rub is just divine. We used filets but you could substitute any good steak. The mixture of sugar, mushroom and spice makes an amazing caramelization and kick from the red pepper and black peppercorns. 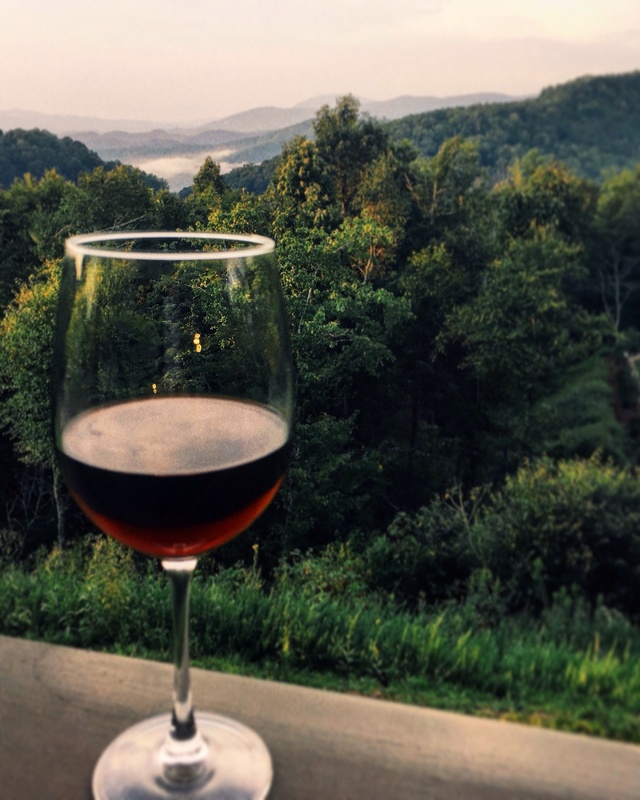 Just add a good glass of red wine and some mountain views and you’ll be set! (Mountain views optional). Process the mushrooms in a spice grinder until they form a powder; place it in a jar. Process the salt and peppercorns in the same grinder and add it to the mushroom powder. Process the sugar in the grinder and add it to the mushroom mix. Process the garlic and red pepper flakes in the grinder, add it to the mix and shake it all up. Place the mixture on a sheet pan and coat all sides of the steaks with the rub. Lightly coat a grill pan with olive oil and heat it over medium-high heat. Place the steaks on the hot pan and cook for 7 minutes on each side. Allow the steaks to rest on a platter while you make the salad. Put the arugula in a bowl and toss with the lemon juice. Slice the steaks crosswise. Place the salad on a platter and arrange the sliced steak on top. Sprinkle Oven-Dried Cherry Tomatoes over the steak and drizzle with balsamic vinegar before serving. Place the tomatoes in a bowl and drizzle with olive oil. Sprinkle with salt, black pepper and pepper flakes, if using. Toss well and place on a sheet pan in a single layer. Place the sheet pan in the oven and roast for 3 hours, tossing occasionally. Next Bread Cheese? Yes, Bread Cheese!